Different Aspects of Social Media. Social networking has revolutionized the way people interact virtually and has emerged as a huge platform for people to connect and communicate over the web. Social networking has not only remained tot the boundary limits of college students and company employees. It has spread far and wide incorporating different types of users. Not only students and educators are enjoying the benefits of social media, also are the institutions, communities and big brands for the purpose of marketing their brands to mass population. Using social networking sites to connect to future classmates and alumni has become a trend amongst students. Facebook is by far the most popular social media platform amongst brands. Even before brands thought of making use of social networking for marketing activities, numerous brands had unofficial presences on Facebook in form of groups and fan pages created by users. Twitter which is slowly but gradually gaining popularity and is more viral that facebook is seen as a platform for the celebrities to connect with their fans and also by some of the brands to communicate with their customers. With twitter you can update all your potential social platforms via a single tweet. you can feed your tweets into the linkedIn status feature as well as post it in your Facebook account and even your Facebook Fan Page. It also tell about what the people around are currently talking about. LinkedIn is perceived as a networking tool for professionals than for marketing. People sharing here information are more in control and they are aware of the authenticity of the information. In February 2009, comScore Inc released a report on the top social networking sites in India claiming visitation to the site category had increased by 51 percent since the previous year. Their recent report also revealed that Facebook and orkut were the top two social networking sites visited by Indians. It allows the users to share knowledge, ideas, thoughts and skills with peers. This with popularity and acceptance among the users makes the social networking a boon. The trend of socializing with politics is not just limited to the developed nations. In INDIA you can see the Facebook Fan pag of political parties. These pages are not only used to update status messages but also videos, polls and events for discussions. The social media is also being used by the law enforcement agencies and citizens. 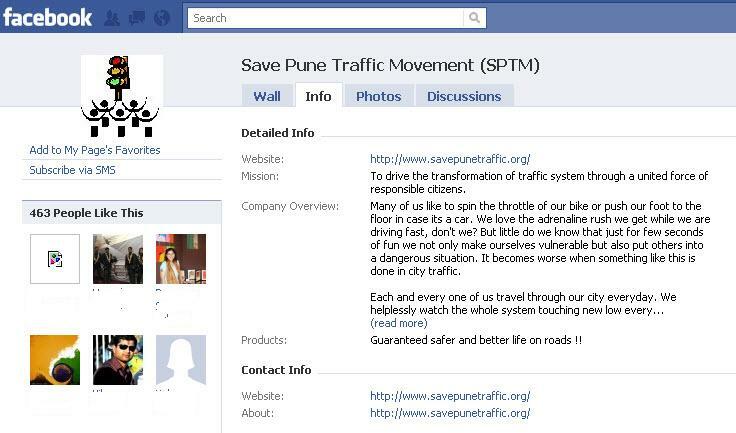 The Pune Traffic Police and Save Pune Traffic Movement (SPTM) launched its page this year! enabling commuters to file complaints againgt bad fellow drivers by providing images and videos as photographic evidence. As of today Pune Traffic Police has 12,697 followers. 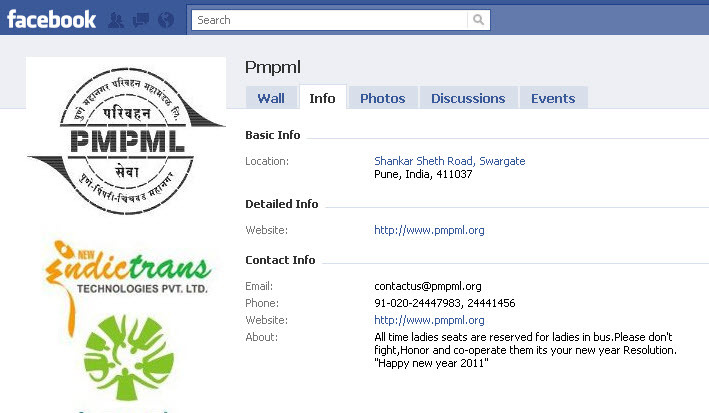 On 1st Jan 2011 even our Pune’s own Pmpml launched its fan page. It says – Click a PMPML driver using cellphone while driving, get a Rs1,000 reward. If you find a Pune Mahanagar Parivahan Mahamandal Limited (PMPML) driver speaking on a cellphone while driving the bus, click a photograph and upload it on the social networking site Facebook and earn a reward of Rs1,000. 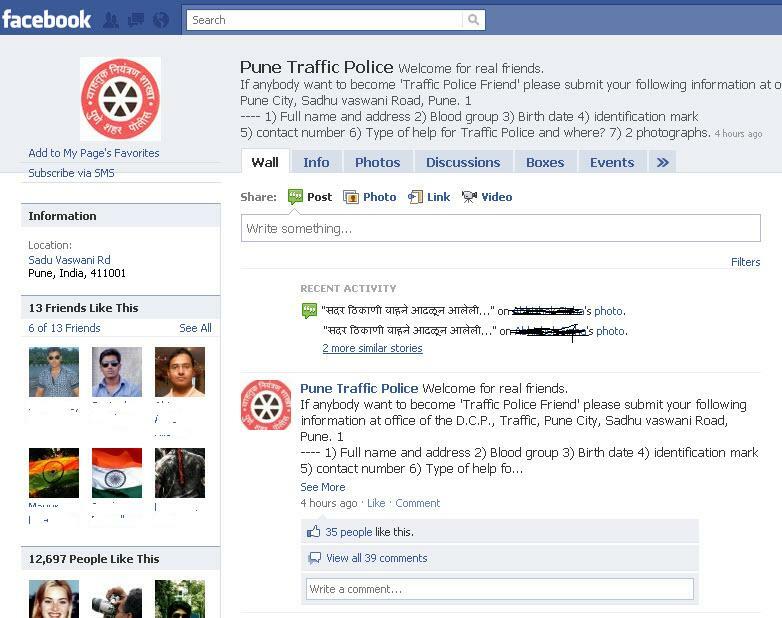 After traffic police, the PMPML has also decided to use Facebook for improving their service. PMPML’s public relation officer, Deepak Pardeshi, said the PMPML has created a Facebook account to give satisfactory service to commuters. “One of the reasons for accidents is the use of cellphones while driving. The PMPML also received complaints that some of the drivers are using cellphones while driving,” he said. Earlier, the PMPML announced cash awards for citizens who will submit the photographs of PMPML buses which stopped on zebra crossing on the signals. But that time citizens needed go to PMPML office to submit the photograph. “To avoid the inconvenience, the PMPML decided to use Facebook. All that a citizen has to do is click a photograph and upload it on the site,” said Pardeshi. They can upload the photograph on Facebook with essential details like the bus number, timing and the persons contact details. The PMPML will verify it and make necessary arrangements to give the award. The PMPML authorities also said that bus conductors do not return money to commuters if they do not have change. They ask them to collect the money from the PMPML depot. Commuters can also report such cases on Facebook. With the people embracing new technologies the social experience is surely going to be better day by day!